So I went to Nandos, a restaurant famed for its chicken, and had steak. I don't even mean a chicken steak, I mean a full on beef fillet steak, served in a pitta. Obviously my intention when I went into to Nandos was to have some of their chicken but there was a neat "New" label next to this dish and I found myself ordering it. It just seemed such an odd concept having a different meat in a chicken restaurant. I guess I felt like one of those people who go to Indian restaurants and order chicken and chips. The steak is seasoned with the usual options of spice levels, so I opted for my usual Medium heat. It comes with chargrilled veggies served in a pitta, and I chose peri-peri chips and coleslaw to accompany it. When it arrived it looked like quite a decent sized piece of meat, and there was plenty of veggies like chargrilled red peppers in the bread. These were actually in a base of tomato sauce that did make eating the Pitta a little bit more difficult, as it leaked some of the tomato while I was working my way through it and I ended up needing serviettes to keep my fingers clean. Although I was ordered Medium heat (my usual) it did feel hotter than that, and had a stronger tingle and burn. Perhaps there was some extra heat mixed in with the veggies or maybe the chef was a little more heavy handed with the spice pot. I could still pick up on the meaty flavour of the beef though, and I have to say it did work nicely with the Nandos spices. The veggies added a nice mix of texture and the peppers and tomato taste worked well with the meat. The steak itself was soft and a good quality piece of meat, which meant it was easy to eat in the pitta bread. I recommend the coleslaw to cool the mouth if the heat is too hot for you too. The New Beef Fillet Steak & Chargrilled Veg also has the option to be served in a Wrap instead of a Pitta and I think I might try this next time as I suspect it would hold the sauce better and avoid the sticky fingers I ended up with. 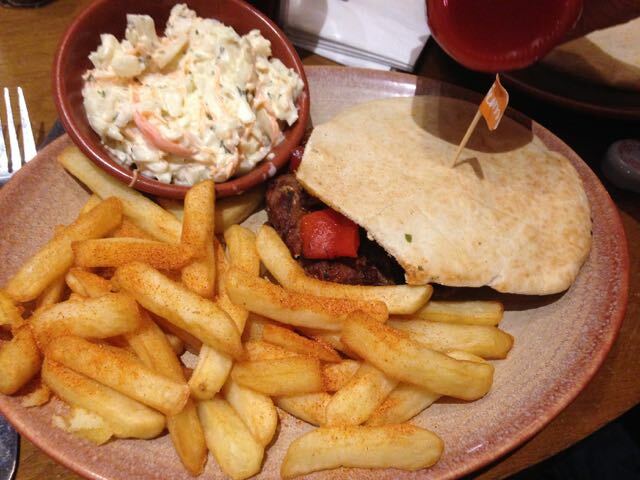 I would happily go back to Nandos and order the beef again, it works well and is a nice addition to their menu. Nice to see the chicken experts doing something different.